Many anglers spend their entire lives on a quest to master a certain species, technique or fishery. I have a tremendous amount of respect for the guys and gals who have figured out how to routinely catch monster bass, trophy redfish or stud yellowtail. But I don’t share that particular passion. I prefer to be a jack of all trades and a master of none. For me, there’s no greater challenge than heading into unfamiliar waters with a goal of figuring out how to land a species of fish you know next to nothing about. Don’t get me wrong, there’s nothing easy about it. But the struggle is what makes hooking up so rewarding. Somehow, I’ve been blessed with the opportunity to travel the world chasing new and unique species from a little plastic boat. While there are dozens of fish that deserve to be on this list, the following are my five most memorable catches. I’ll never forget the feeling of anticipation during my 21-hour drive from Dallas to southeast Florida. 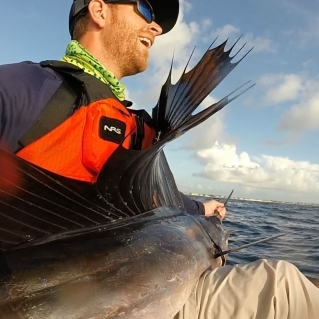 While the initial draw to what could be argued as The Best Offshore Fishery in the country was the wide variety of species I’d have access to, one fish in particular stood out above the rest: Atlantic sailfish. 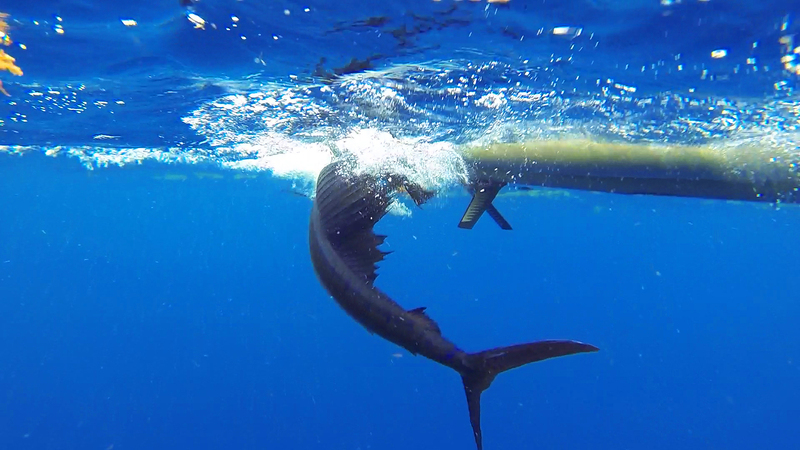 Being one of the fastest and most acrobatic fish in the ocean, sailfish are as difficult to land as they are beautiful. 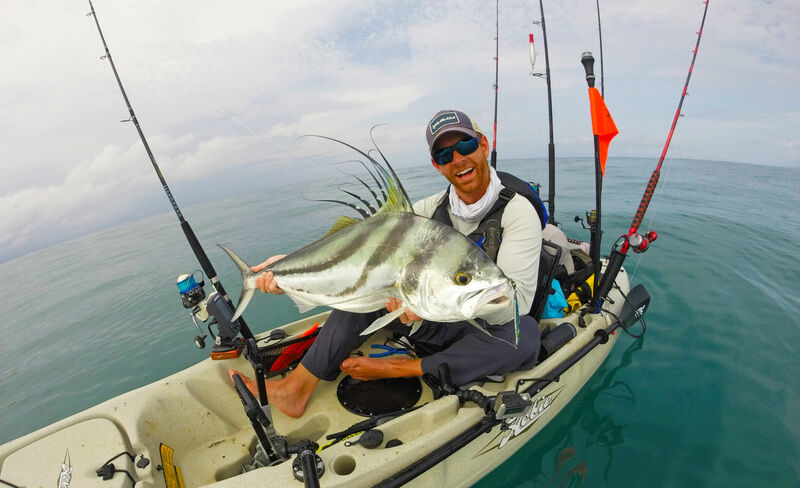 Having zero experience in this type of fishery, I was grateful that my friends at Deep Blue Kayak Fishing agreed to take me out and show me the ropes. The rest of the day is mostly a blur, except for that instant at the end of the day when my live bait got smacked and my reel started screaming. I yelled to Eric, “I think it’s a shark!” Then, as if I offended it, the 6-foot sailfish breached the water and began greyhounding away from me at alarming speed. Ten minutes later and the fish was under the kayak, but the battle had only just begun. The fish jumped and thrashed next to my boat, its sword-like bill coming within inches of me several times, and I began to wonder if I had bitten off more than I could chew. Fortunately, I had my NRS Castaway gloves with me, because the only way to secure a sailfish is by grabbing its extremely abrasive bill. I put a glove on one hand while controlling the rod with the other, and soon the fish I had been dreaming about for months was lying across my lap. The next best moment of the day? Watching that beautiful girl swim off strong. Sometimes you target a new species because of their strong fight, other times you’re in it for their delicious meat. But with the roosterfish, appropriately nicknamed the “Punk Rocker of the Sea,” the appeal for me was that they simply look cool as hell. So, when I was invited to come fish at Los Buzos Resort on the Pacific coast of Panama, I jumped at the opportunity. But on my fifth and final day at the lodge, despite having scratched yellowfin tuna, bluefin trevally and a variety of snapper species off my list, I still found myself completely bummed. Where were the roosters? Our group of eight had only caught one, and with just a couple hours remaining in our trip, I had all but given up. I was exhausted, covered in cuts and bruises and sunburnt on my legs and face. My NRS H20zone Neck Gaiter was the most valuable piece of gear on my kayak at this point. I decided to spend what little time I had left fishing as hard as I possibly could. That meant a lot of vertical jigging. While this is one of the most exhausting methods I know, it’s extremely effective. Before long I was hooked up, but after a grueling fight it turned out to be a jack crevalle, a species I’ve caught plenty of in Texas and Florida. Over the following thirty minutes I battled four of these brutes, and by the fourth, I was completely spent. I removed the jig from the last jack’s mouth and tossed it into the ocean. Feeling defeated, I explained to the camera that sometimes things just don’t work out the way you want. 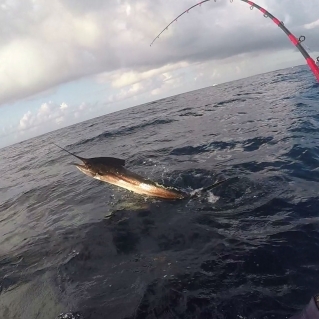 After releasing that fish, I looked down to see I had left the bale open on my spinning reel, and the jig was plummeting to the bottom of the ocean. “Well, I might as well jig it back up,” I said. Three jerks of the rod later and I was hooked up again. Knowing with certainty that it was another jack crevalle, I whined to the camera about these fish bullying me. Then, as the feather-like dorsal fins broke the surface, my heart stopped. “IT’S A ROOSTER!” I yelled to no one in particular. And that was how I knocked one of the top species off my bucket list: by total accident and whining the entire time. 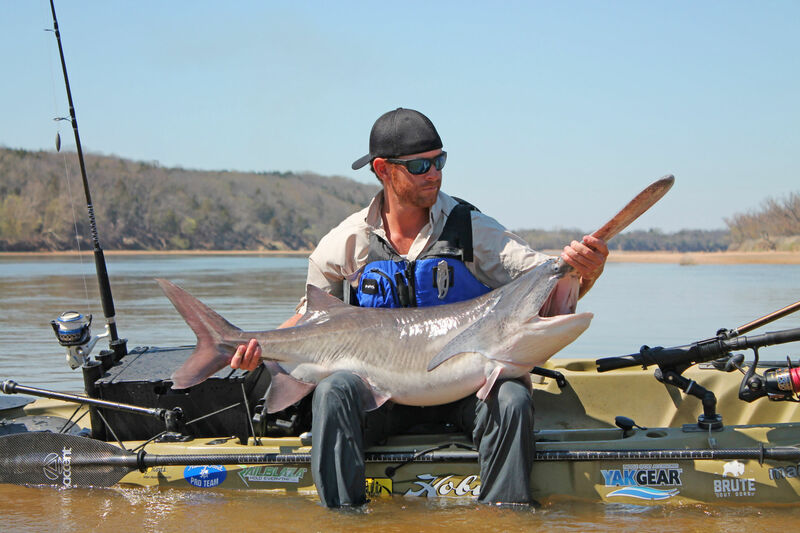 Ever since I began kayak fishing, I’ve had a strong interest in catching “unconventional” species that aren’t typically associated with our sport. 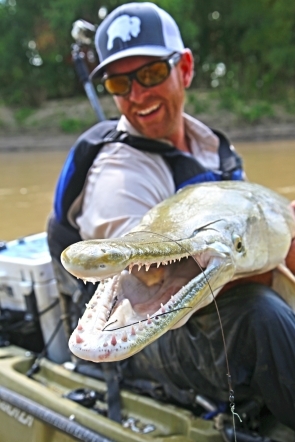 When I met world-renowned alligator gar guide Bubba Bedre (www.bubbabedre.com) at a convention in 2015, it didn’t take much twisting of the arm to convince me to try and land one of these dinosaurs from a kayak. Bubba put Jeremy Wade on his first gar during an episode of River Monsters, so I had high hopes leading up to the trip. As fate would have it, the Trinity River was at flood stage when I arrived, making an already difficult task seem all but impossible. But if it were easy, everybody would do it, right? Because of the extreme flow, we used Bubba’s boat to mothership my kayak up and down the river, but there wouldn’t be much he could do once I was hooked up to a 100+ pound fish with the head of an alligator. 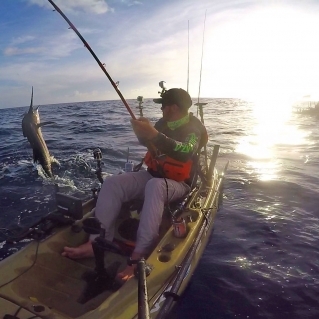 Landing these fish was one of the biggest challenges of my fishing career. Due to their bony mouths and eating technique, I was required to let them run around with my bait in their mouth for up to ten minutes before setting the hook. Ten minutes felt more like ten years. When I came tight on my first gator gar—damn I’ll never forget that. It exploded out of the water, thrashing its head back and forth. All I saw was teeth. Lots and lots of teeth. With the river moving at about six knots and the fish towing me downriver, that may have been the fastest my kayak has ever moved. Thirty minutes later and I had the fish secured, but I didn’t feel that sense of relief that normally comes with landing a fish you’ve been dreaming of. These animals are slimy, covered in sharp scales and need I repeat, they have the head of an alligator. I’ve never been so terrified to hold a fish in my life, and carrying them while sinking a foot deep into the muddy river bottom was no easy task. Had it not been for my NRS Crushes, I may never have made it back into my kayak. Once we had the hook removed, I waded into the river and watched as she slithered out of my arms and back into the murky depths. I’ve never been so covered in mud, slime and blood—my blood—in my fishing career, but it was all worth it. With Bubba’s help, I landed six more before calling it a day due to exhaustion. Last October I embarked on a 33-day, 6,000-mile road trip to fish my way up the west coast. Three weeks into the expedition, I was near Portland, Oregon on the Columbia River. Our target was Chinook salmon. Having no clue what I was doing, my guides Robert Perea and Justin Wesson let me borrow their salmon gear—a light fiberglass rod and a small baitcaster reel spooled with 30-pound test line. The strategy was simple: tie on a heavy weight below a tiny barbless hook, string on a glob of salmon eggs, drop it down to the bottom, bring the bait a few cranks off the bottom and just let it sit there. Salmon will eat competitors’ eggs during the spawn to increase the chances that their own eggs get fertilized. About an hour into the day, I pedaled upstream for another drift and dropped my bait down, but when I tried to bring it up a few feet, it wouldn’t move. “I’m hung up,” I told Justin. I popped the rod repeatedly, trying to free it from the snag. Then the snag began to fight back. Seconds later my line shot to the left, and as my gaze followed it, an 8-foot, 275-pound white sturgeon broke the surface and tail-walked about twenty feet before plunging back into the frigid waters. “Oh God,” were the only words to escape my mouth. The entire group I was with began yelling frantically, barking orders to do this and that. I comprehended approximately none of it. 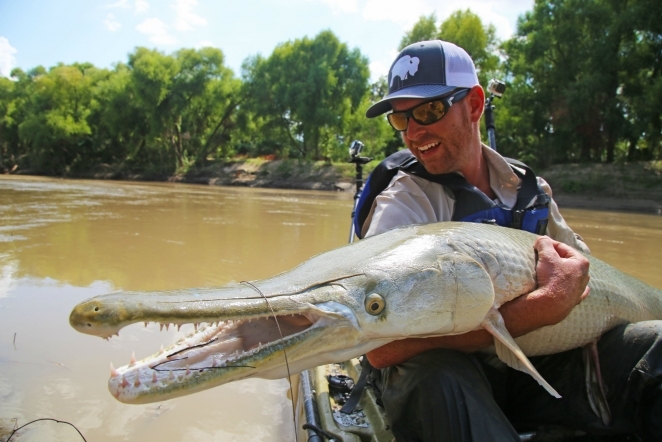 Three animals have called the North American continent home longer than any others still around today, and all three are on this list: sturgeon, alligator gar and paddlefish. Of the three, paddlefish (commonly nicknamed “spoonbill catfish” despite not being part of the catfish family) is the most ancient. I had seen photos of these prehistoric beasts caught by Brent Wilson, and I just had to give them a try. I arrived at the boat ramp in the middle of nowhere around midnight and slept in my truck. Brent and his wife met me early the next morning, and we set off down the river. These fish typically live in lakes, where finding them requires about as much luck as winning the lottery. But every spring they head upriver to spawn, where they become concentrated in the deep pools found at every bend in the otherwise shallow Arkansas River. Brent told me not to get my hopes up; he said I’d be lucky to hook one of these elusive animals. He also told me that if I did hook one, I better not mess it up. Not an hour into the day I was hooked up to a monster fish, and the strength and speed of that animal was more scary than exciting. Oklahoma game laws dictate the use of barbless hooks when targeting these fish, and less than a minute into the fight the hook slid out. Devastated, I was determined to get a second. A few hours later I had hooked and lost seven paddlefish in what I still consider the most frustrating day of my entire life. Most of the footage of the seventh one was unusable because it featured more “bleeps” than actual words coming out of my mouth. Then, just before sunset, I hooked another. It went airborne almost immediately, and I saw the line had wrapped around its rostrum (elongated nose), and I had a feeling this one wasn’t going to get away. These fish are no pushovers, and despite not landing one at this point, fighting seven of them had me spent. After another back-breaking battle, during which I spent most of my energy avoiding boulders and log jams as the behemoth towed me up and down the river, I finally got my hands on what I had come for. 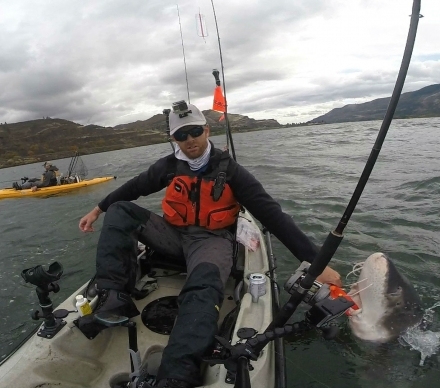 Then the real challenge began: pulling the 80-pound fish into the kayak. Twice the fish almost landed me instead of vice versa. 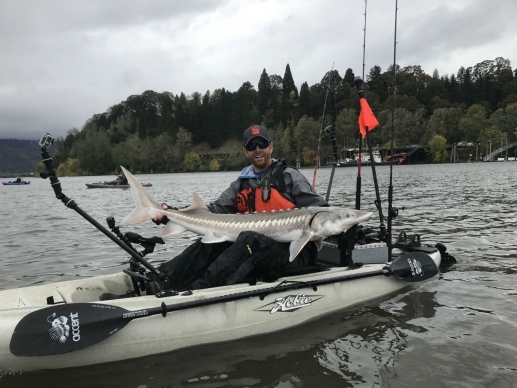 Luckily, my NRS Chinook PFD kept me upright, and the feeling of finally besting that species is one I’ll remember for the rest of my life.